The financial markets industry is at the same crossroads as the automotive industry in the late 1970s. Margins are collapsing and customization is rapidly increasing. The automotive industry turned to quality and its no coincidence that in the money management industry many of the spectacular failures have been due largely to problems in quality control. The financial industry in on the verge of a quality revolution. New and old firms alike are creating new investment vehicles and new strategies that are radically changing the nature of the industry. To compete, mutual funds, hedge fund industries, banks and proprietary trading firms are being forced to quicklyy research, test and implement trade selection and execution systems. And, just as in the early stages of factory automation, quality suffers and leads to defects. Many financial firms fall short of quality, lacking processes and methodologies for proper development and evaluation of trading and investment systems. Authors Kumiega and Van Vliet present a new step-by-step methodology for such development. Their methodology (called K|V) has been presented in numerous journal articles and at academic and industry conferences and is rapidly being accepted as the preferred business process for the institutional trading and hedge fund industries for development, presentation, and evaluation of trading and investment systems. The K|V model for trading system development combines new product development, project management and software development methodologies into one robust system. After four stages, the methodology requires repeating the entire waterfall for continuous improvement. The discussion quality and its applications to the front office is presented using lessons learned by the authors after using the methodology in the real world. As a result, it is flexible and modifiable to fit various projects in finance in different types of firms. Their methodology works equally well for short-term trading systems, longer-term portfolio management or mutual fund style investment strategies as well as more sophisticated ones employing derivative instruments in hedge funds. Additionally, readers will be able to quickly modify the standard K|V methodology to meet their unique needs and to quickly build other quantitatively drive applications for finance. At the beginning and the end of Quality Money Management the authors pose a key question: Are you willing to change and embrace quality for the 21st century or are willing to accept extinction? CIOs and IT Directors in financial services industry, particularly investment houses and banks; software vendors and technology companies who provide solutions for financial services industry; graduate students in financial engineering and financial markets courses and programs. Ben Van Vliet is a Lecturer at the Illinois Institute of Technology (IIT), where he also serves as the Associate Director of the M.S. Financial Markets program. At IIT he teaches courses in quantitative finance, C++ and .NET programming, and automated trading system design and development. He is vice chairman of the Institute for Market Technology, where he chairs the advisory board for the Certified Trading System Developer (CTSD) program. He also serves as series editor of the Financial Markets Technology series for Elsevier/Academic Press and consults extensively in the financial markets industry. 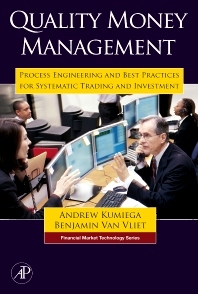 Mr. Van Vliet is also the author of "Modeling Financial Markets" with Robert Hendry (2003, McGraw Hill) and "Building Automated Trading Systems"(2007, Academic Press. Additionally, he has published several articles in the areas of finance and technology, and presented his research at several academic and professional conferences.